This guide should help answer many of the more common questions USATF has heard over the years. If you have additional questions, please feel free to discuss with the clubs Head coach. Generally speaking, how do track meets work? Youth track meets offer all events in multiple age group divisions. Typically, all the age groups will compete in a certain event and then the meet will move to the next event; that is, they’re not organized such that all Bantam, and then all Midget and then all Youth events are held. It’s possible that your child may compete in the first and last event of the day. Track meets typically run on a rolling schedule, meaning that upon completion of one event the next one closely follows. Because of this – and the fact that events may take more or less time than expected – it’s impossible to tell at exactly what time your child will compete (unless he/she is participating in the first event of the meet). In which age group will my child/ren compete? Qualifying meets are those meets at which your child must be in attendance and achieve certain performance criteria in order to qualify for the next higher meet. The qualifying meets for Illinois is the State (Association) meet and the Region 7 meet. 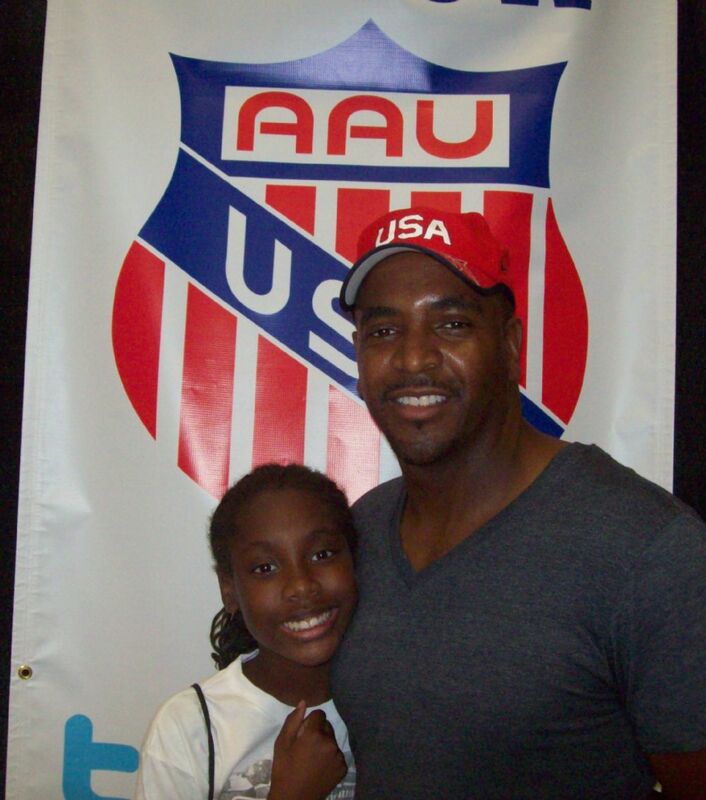 Your child must compete in both meets in order to qualify for the National Junior Olympics meet. How long do meets last? Track meets are multi-hour, sometimes all-day events. And some of the larger meets – state, regional and national competitions, for example – are spread over two or more days. Make sure you check the appropriate meet schedule to determine which day(s) you need to be in attendance. How early do we need to arrive at the meet? It’s a good idea to arrive an hour or so before the meet is scheduled to start. This allows time for you to complete the registration and/or check-in process. (Even if you’ve pre-registered for the meet, athletes typically must check in upon arrival.) It also allows time for your child to warm up on the track and to orient him/herself with the complex (e.g., location of heating tent, restrooms, etc.). What must I have to complete the registration process? You’ll need to know two things – (1) the event(s) in which your child will be competing and (2) your child’s USATF number. It is also a good idea to have a copy of your child's birth certificate. How much does it cost to register for a track meet? Each track meet is different. Amounts may be fixed or may depend on the number of events in which your child will be competing. Generally, meet registration costs between $5 and $50. In which event(s) should enter my child? Generally, your child has either been training as a sprinter or a distance runner and coaches will have worked with your child to determine the optimal running events for him/her. During early-season meets, however, athletes and coaches may still be working to determine the event(s) in which athletes are strongest. If your child has been working out with the sprinters, it’s best to place him/her in sprint event(s) – 100 meters, 200 meters and/or 400 meters. If he/she has been training with the distance group, middle- to long-distance races – 800 meters, 1500 meters, 3000 meters – are preferable. If a change subsequently needs to be made regarding optimal running event placement, coaches will work with the athletes accordingly. Hurdlers and field athletes – jumpers, throwers and vaulters – should be placed in the event(s) in which they have been training. How will I know when it’s my child’s turn to compete? First, you’ll have to know in which age division and event(s) your child will be competing. Then, you’ll listen for the announcement of a “first call” for that event. For example, the announcer will announce over the public-address system, “First call – bantam girls, 100 meter dash.” If your child is signed up to compete in this event, she should then make her way to the clerking (Check-In) area. What should I bring to the track meet? Track meets are hours-long events, so it's important for athletes to come prepared (after a good, carbohydrate-rich breakfast, of course). You should bring proper foods and drinks for your athlete (e.g., water, pretzels, fruit, bagels, trail mix, crackers, orange slices, raisins, etc. ); weather protection (e.g., canopy/umbrella, sunscreen, blanket, hat, sunglasses, etc. ); comfort items (e.g., portable chair, pillow, cooler, seat cushion, insect repellant, etc. ); and stuff to keep everyone entertained (e.g., books, puzzles, games, iPods, homework, etc.). Concessions typically are available at track meets. How can I help ensure my child achieves peak performance? You can help ensure your child performs at his/her best at meets by providing a carbohydrate-rich breakfast to begin the day. It’s also important that while at the venue he/she remains in the shade and engages in minimal physical activity when not stretching, warming up or competing. And most importantly, encourage and support your child – not only the day of the meet but throughout the season. Where can I find the results from the meet? During the meet, official results typically are posted in a common area as the events are completed. Additionally, we will post all results on our website after the meet. .